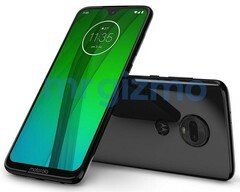 Although most technical details are not present in the TENAA listing, the appearance of the Moto G7 XT1965-6 model on the website of the Chinese certification authority comes with information regarding the physical dimensions of the device, its display size, and the capacity of its battery. After countless leaks and rumors, the handsets from the upcoming Moto G7 lineup are now showing up on the websites of various certification bodies. Today, the time has come for the Moto G7 XT1965-6, a handset that has just been spotted on the website of the Chinese certification authority TENAA. Sadly, there are no images of the Moto G7 on the TENAA website yet, but some highlights have been confirmed by this official listing. According to TENAA, the Moto G7 XT1965-6 sports a 6.24-inch display with an unknown resolution. However, there is little room for surprises here, so the display of this handset most likely features a 19.5:9 aspect ratio and 1,080 x 2,340 pixels. TENAA also confirms a 2,820 mAh battery capacity and 156.9 x 75.3 x 8.2 mm (or 6.18 x 2.96 x 0.32 inches), as well as the existence of dual-SIM dual standby capabilities. The leaks and rumors concerning the Moto G7 that we bumped into so far also mentioned 27 W wired fast charging, a Qualcomm Snapdragon 632 processor, up to 4 GB of memory, 64 GB of internal storage space, an optically-stabilized dual camera setup on the back, as well as a rear-mounted fingerprint reader. The Moto G7 should be unveiled alongside the Moto G7 Play, Moto G7 Power, and Moto G7 Plus on February 7. Obviously, these handsets will run Android 9.0 Pie straight out of the box.